If you want to know how to replace a roof, it is important to know the basic steps and components. There is a classic joke on contractor forums: "How do you replace a roof?" "Step 1: Call a roofer." Learning how to replace a roof is not like learning install a new countertop yourself. Roofing is not recommended as a Do It Yourself project. It takes a lot skill and know-how, and the cost of doing it wrong will far exceed the initial cost of having it installed by a professional. For example, for a basic asphalt shingle roof, you must be accurate with not only the location of your nail, but the pressure you give it. Too much pressure will send the nail through the material, and too little will end up ripping a hole in the shingle above it. It is possible to learn how to replace a roof yourself, but a few types should always be left to professionals. These include tar-and-gravel, modified bitumen and slate. It is easier to learn how to replace a roof yourself made of metal sheeting and rubber roll. The rafters and trusses that support the decking. The boards attached to the roof rafters to cover the house. A waterproof layer installed in between the roof decking and the roofing material. 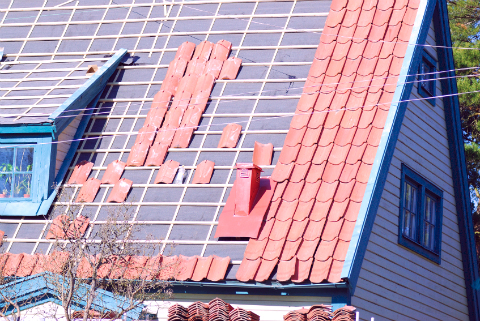 Metal strips laid into valleys and joints of a roof, such as around chimneys or pipes, to prevent water leakage. This includes drip edge flashing, which is situated along the edge of the roof. The shingles or tiles that make up the outermost part of the roof. This can be made from many materials, such as asphalt, metal, rubber, slate or clay. 1) Plan ahead. Ensure you have good weather, the proper tools, safety equipment, materials and waste disposal facilities. 2) Rip off old roofing, and clean the roof bed of old nails and any debris. 3) Repair roof bed if necessary. Look for cracks, holes and rot. If you do decide to learn how to replace a roof yourself, it is a good idea to contact a professional roofer for a consultation and inspection.